Still thinking about the late Terrence Des Pres. 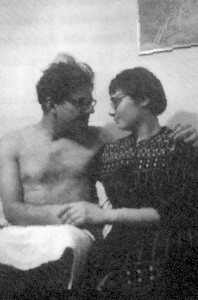 When I first knew him (mid-’70s) he was spending time with the political poet Carolyn Forche. He finished The Survivor (a struggle, to say the very, very least) and became well known for that book (deservedly, but there was always much more to Des Pres than that book). Later, through a poem by Forche (and in many other ways, of course), I came to learn more about what kind of struggle it was for him to write The Survivor. In the poem, “Ourselves or Nothing,” Forche tells us of finding notes TDP had written to himself and, after an all-night attempt at writing, left for himself on his desk for the morning. “you will live and die / under the name of someone / who has actually died.” And another message (although not one for which Forche was present): “Finish this or die.” Here is a copy of that poem. Last July, Edit Publications launched eleven books expanding Tan Lin's Seven Controlled Vocabularies and Obiturary 2004, The Joy of Cooking (Wesleyan Poetry Series, 2010). These printed editions derive from an event at the Kelly Writers House at the University of Pennsylvania on April 12th, 2010 titled "Handmade book, PDF, lulu, Appendix, Powerpoint, Kanban Board/Post-Its, Blurb, Dual Language (Chinese/ English) Edition, micro lecture, Selectric II interview, wine/cheese reception, Q&A (xerox), film." Books published include: Purple/Pink Appendix by Tan Lin with an introduction by Danny Snelson, afterword by Charles Bernstein and indexes by Lawrence Giffin, Ashley Leavitt, John Paetsch, Danny Snelson, and Tan Lin. Blurb by Tan Lin. Event Inventory and Documentation (monochrome and polychrome editions) by Jeremy JF Thompson. Selected Essays About a Bibliography, with contributions by forty-eight authors. 7CV Chinese Edition (1-4) (七受控詞表和2004年訃告). 7CV Critical Reader, with full text downloads in PDF format. Printed on demand by lulu.com in a continual state of revision. Event Editors and Authors include: Matthew Abess, Chris Alexander, Louis Asekoff, Stan Apps, Danielle Aubert, Charles Bernstein, Marie Buck, Lee Ann Brown, E. Shaskan Bumas, Ken Chen, Evelyn Chi'en, Clare Churchouse, Cecilia Corrigan, AMJ Crawford, Kieran Daly, Monica de la Torre, Thom Donovan, Patrick Durgin, Kareem Estefan, J. Gordon Faylor, Al Filreis, Thomas Fink, Mashinka Firunts, Robert Fitterman, Jonathan Flatley, Brad Flis, Peter W. Fong, Christopher Funkhouser, Kristen Gallagher, Sarah Gambito, Ellen Gruber Garvey, Kenneth Goldsmith, Cecilia Gronberg/Jonas (J) Magnusson, Heidi Brayman Hackel, Erin Gautche, Lawrence Giffin, Diana Hamilton, Eddie Hopely, Paolo Javier, Greem Jellyfish, Josef Kaplan, John Keene, Diana Kingsley, Matthew Landis, Ashley Leavitt, Tan Lin, Warren Liu, Jessica Lowenthal, Sueyeun Juliette Lee, Maya Lin, Warren Liu, Dana Teen Lomax, Patrick Lovelace, Dan Machlin, Rachel Malik, Josiah McElheny, Stephen McLaughlin, Joe Milutis, John Paetsch, Asher Penn, Ellen Quinn, Diana Ro, Raphael Rubenstein, Jay Sanders, Katherine Elaine Sanders, Karen L. Schiff, Jeremy Sigler, Danny Snelson, Carlos Soto, Kaegan Sparks, Chris Sylvester, Gordon Tapper, Michelle Taransky, Jeremy JF Thompson, Richard Turnbull, Dan Visel, Dorothy Wang, Andrew Weinstein, and Sara Wintz. You can download everything at once, or you can purchase individual copies of the volumes - or download each separately. Your friendly blogger here has an essay in the volume called "Selected Essays About a Bibliography." Click here and you should get to a page where you can buy a copy of that book. 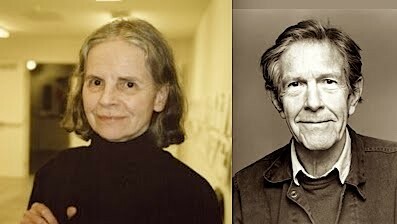 Cole Swensen was a guest on Leonard Schwartz’s radio program, “Cross-Cultural Poetics,” back in January. 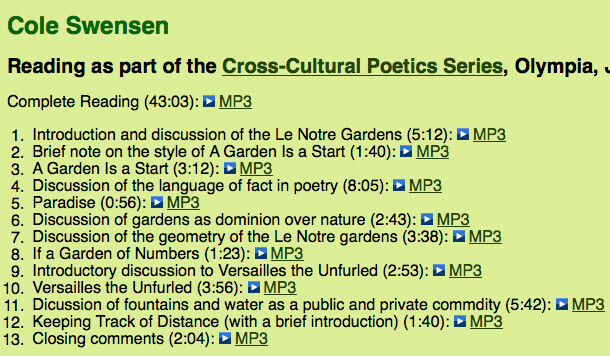 Thanks to Henry Steinberg, now PennSound offers a segmented recording of the reading and discussion. Swensen offers a reading of “A Garden Is a Start” and then takes a few minutes to talk about the style of that poem. She reads “If a Garden of Numbers” but we are also treated to her discussion of the geometry of Le Notre gardens, of gardens taking dominion over nature, of fountains as a public commodity. (The readings were from her recent book, Ours.) It’s all here — available as of just yesterday. By the way, I’m happy to say that Leonard Schwartz was here at the Writers House this fall (9/23/10) — and was also a guest on PoemTalk. Joan Retallack's "Not a Cage"
Here is the text* of Joan Retallack's poem "Not a Cage." And here is a recording of Joan reading the poem at Buffalo in 1993. * from How To Do Things with Words, Sun & Moon, 1998.